The minimalist touch is given by Tamás Jakus (Jakusa Design), a Hungarian builder who has a touch of 'magic' for the Triumph Speed ​​Triple 1050. It is not give a significant change, but the final results named Type35 is seen stealing attention. Jakus do not have to devote his energy to perform welding or sawing the parts of motorcycle modification. He simply take advantage of the original components of Triumph and some extra parts for the ​​Triple Speed. "Less is More", that's what it's shown by an experienced builder to modify this motorcycle. 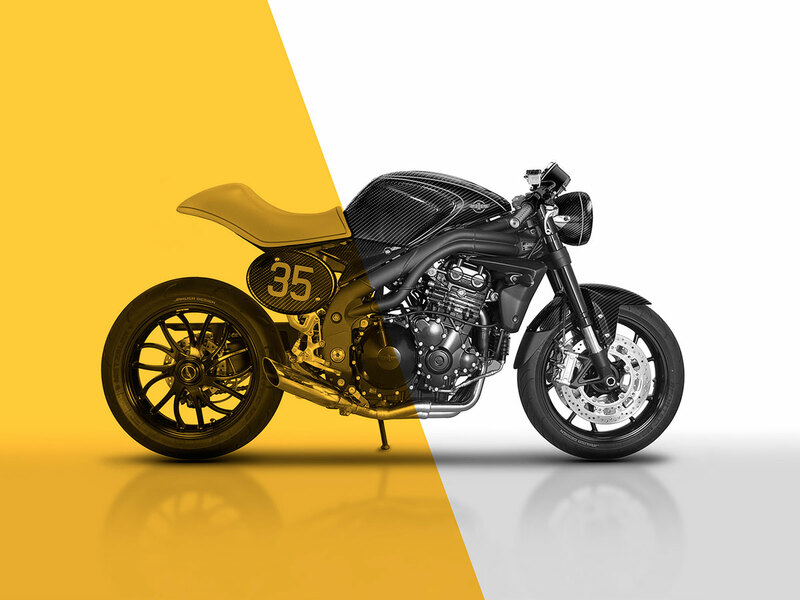 Only a few changes were given to the ​​Speed Triple, the whole bike look more stylish. Carrying a classy style, not pinning things that look complicated. Builder shrewdness in combining carbon fiber components, becoming the important keys in the roadster or naked bike modifications. 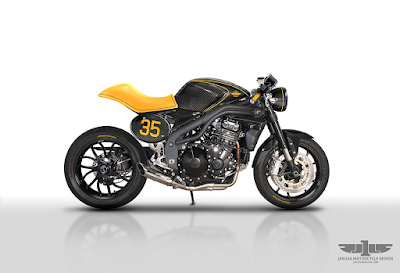 This time, Jakus pinned seven components of carbon fiber materials in his motorcycle custom. The seven components it covers, front fenders, number plates in front and rear, two left and right plates, the fuel tank cover and headlamps. The use of carbon fiber materials, as for the fuel tank can reduce the weight of the motorcycle. The manufacturing process is fairly easy for a workshop which would have advanced processing carbon fiber. They do not take long to make the components of carbon fiber material. The most noticeable changes are made on the ​​Speed Triple, presumably occurred on the rear sub frame is substituted with the shorter models are aligned with the rear lights and turn signal. However, the changes are not too extreme.